'Jolt' (John Weiler, R. 1988). Seedling# 81-90-3. TB, 32" (81 cm), Late midseason bloom. Lightly wavy ruffled fiery orange, small yellow spot at end of carrot red beard. Seedling# 78-60-1: (seedling# 74-122-1: (('New Moon' x (('Glittering Gold' x 'Orange Crush') x ('Ballerina' x 'Orange Crush'))) x 'Summer Dawn') x 'Sun Fire') X seedling# 79-157-1RE, 'Fame' sibling. Rialto Gardens 1988. From AIS Bulletin #269 April 1988 Introducing JOLT (Weiler 88) TB 32" M-L. The most shocking, deepest fiery orange and yellow combination yet produced with deep, flaming carrot-red beards & a yellow flash at end of beards. 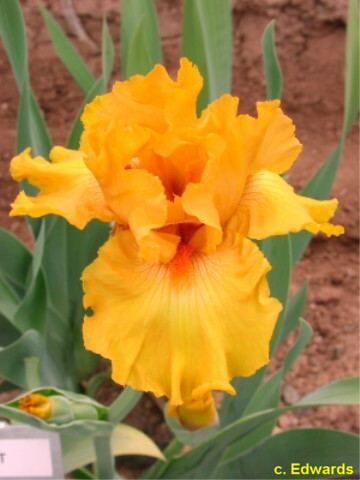 Broad, lightly ruffled petals on 3-branched stalks with 7 buds flower a long time. Abundant bloom on a clump & good increase make this an excellent garden subject. 81-90-3: (((New Moon x ((Glittering Gold x Orange Crush) x (Ballerina x Orange Crush))) x Summer Dawn) x Sunfire) X sib to Fame. $30.00. Rialto Gardens. JPG JoltSI.JPG manage 225 K 16 Apr 2019 - 21:58 Main.TLaurin Photo by Sandy Ives.